Manifest Destiny was a popular 19th century idea which attributed to the United States the right to expand and occupy the North American continent from coast to coast. 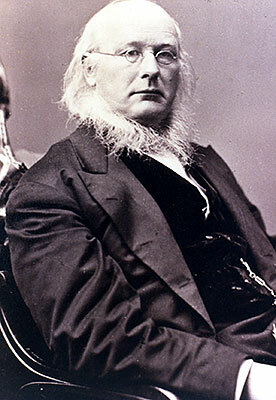 Manifest Destiny was associated with the punchy phrase: "Go West, young man" coined by the newspaper editor Horace Greeley, who thought western expansion was the way to go, both for (white) settlers and for the country as a whole. Not that he was unique in this prescription. I was thinking about the Opening of Japan (where the US Navy forced the Japanese empire to allow trade between Japan and the rest of the world) in the 1850s, when I realized that there was a lot of "Opening" in the 19th century. Think Opium Wars! Or the French Conquest of Mexico! Or the slaughter of Australian aboriginals (Being investigated right now by the Guardian)! How did they justify their actions? Somehow I doubt that I will ever have time to explore this topic --Manifest Destiny on a Global Scale -- but maybe someone else will. Or maybe someone already has! Image: Greeley.